Keeping the inside of a building at a comfortable temperature requires well designed windows to keep heat out during the summer and heat in during the winter. Let’s take a look at how windows provide thermal insulation and how they carry heat (or not) between the inside of a building and the outdoors. Between the two panes is a spacer that holds them apart. Older spacers are made of metal, but metal conducts heat very well — the exact opposite of what a building occupant wants in their window. Hence, structural foam or aluminum coated in a thermal barrier are more commonly used. The space between the glass is filled with a gas that has low thermal conductivity, such as argon or krypton, to reduce heat transfer between the panes. These gases are used because they have an even lower thermal conductivity than air, so they block thermal conduction very well. 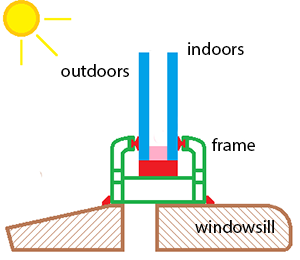 Schematic of a window. The pink block is the spacer and the red areas indicate seals. Image courtesy of Wikipedia. Why might it be then, that my office gets colder than the rest of the building during the winter? It’s important when designing these insulated windows to make sure that the space between the glass is the right width. If there is too much space, convection currents can develop in the gas and, left undamped, will carry heat from the warmer pane to the colder one. If there is not enough space, on the other hand, heat will travel easily from one pane to the other because they are so close together that conduction can occur. When determining the ideal window design, we can turn to simulation software for guidance. The international standard ISO 10077-2:2012 defines how software simulations have to be carried out to predict the thermal performance of windows, doors, and shutters. It also provides a set of benchmarks that simulation software have to pass in order to be validated. COMSOL Multiphysics successfully passes all these benchmarks. Let’s check out one of these benchmark models for simulating the thermal performance in a window. Cross section of a window frame and glazing. The COMSOL model geometry shown above includes the two glass window panes; the filling gas; a spacer composed of a thin aluminum piece, a silica gel layer, and a polyamide layer; a wooden frame containing several cavities; and several blocks of a rubber called ethylene propylene diene monomer (EPDM) that is used for sealing — the presence of the rubber keeps the window frame airtight and waterproof. The make-up of the frame is an important consideration when setting up this simulation to study the thermal gradient. Often, cavities are built intentionally into window frames. They provide thermal insulation as long as the convection in the cavity is limited. The norm ISO 10077-2:2012 classifies each cavity by its shape and the amount of ventilation it is exposed to. Cavities range from unventilated (completely closed), meaning they are contained inside the frame with no connection to the outside boundary, or are connected by a slit of less than 2 millimeters; to slightly ventilated, meaning connected to the interior or exterior boundary by a slit of less than 10 millimeters; to well-ventilated, a term encompassing any cavity not covered by the other two types (and usually more exposed to the outer boundary). The thermal conductivity of the frame also influences how well the window keeps out heat or cold. Plastic or wooden frames, like the one shown in the schematic above, have low thermal conductivity and provide good insulation. Frames made of more conductive materials, like metals, carry more heat from one side of the window to the other. Aluminum frames are often used in commercial buildings because of their material strength, but they require a careful design to have good thermal performance. So how well does a window insulate? In order to model the heat flow across a window, we need to account for the thermal resistance of each material, as well as the geometry (including the size, shape, and location of the cavities). The other variables include the internal and external temperatures, coefficients for heat transfer calculation, and boundary conditions that define the heat flux. As we see from the simulation results, there can be quite a large temperature difference between the exterior boundary of the window glazing and the interior — which means that the window is doing its job well. 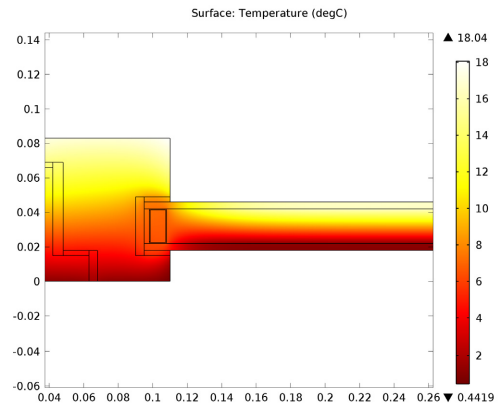 Temperature profile for the COMSOL window model. When a building manager came in recently to check out a draft coming through my office, I paused my work for a moment to watch him measure the temperature at different heights along the wall. I was startled by the extreme temperature changes — the insulated window wasn’t insulating very well at all. Even after the frame was resealed, it was still a little chilly in here, and now I know why. I have problem modeling radiation heat transfer in a slab. A constant radiation hits an slab and part of that is transferred through the slab, part is absorbed within the slab and part is reflected. How should I model this? I already know the absorptance, reflectance and transmittance coefficients of the slab. Please advise. 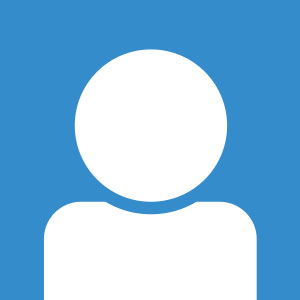 I suggest to get in touch with our Technical Support Team at support@comsol.com.